After watching the disappointing match between Mayweather Jr vs Marquez, I am now hoping to watch some exciting rounds with Manny Pacquiao’s next fight with Miguel Cotto. Though my husband is doubtful if Pacquiao will win this match, I am still convince that whatever the result is, Manny will still remain as the People’s Champ here in the Philippines. Anyway, for those who are anticipating the Manny Pacquiao vs Miguel Cotto Boxing Fight, you can watch them online via HBO Pay per View. 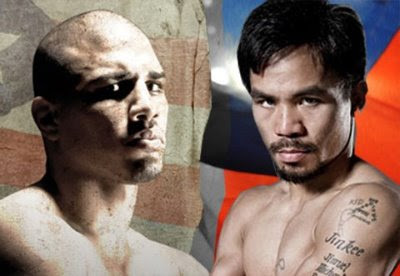 If you want to watch Pacquiao vs Cotto live stream free, check out SOPCAST or JustinTV for possible feeds. If you’re a PLDT myDSL subscriber, you can watch it for free at www.pldtwatchpad.com. And if you like watching it on the big screen, you can now buy tickets at any SM Cinemas nationwide. Speaking of SM Cinemas, they have a raffle promo going on in light of the Pacquiao vs Cotto Fight. 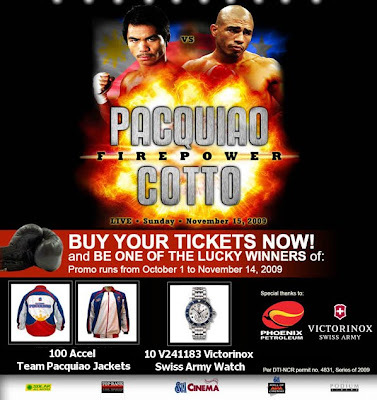 You can win Accel Team Pacquiao Jacket or V241183 Victorinox Swiss Army Watch. Visit www.smcinema.com for more details. Everyone is just as excited as you are! Pero yung husband ko, pareho ng husband po. Baka daw matalo si Pacman. Masyado daw malaki ang kalaban. Pero basta ako, kay Pacman ako no matter what! I have faith in him! Hehe. try nyo sa Justin.tv, maraming channels dun na pwede mag-live stream ng laban ni pacman. 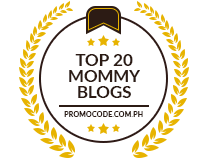 i used to watch there before kami magka-cable. i am definitely watching this fight!